This handbook is intended primarily for the use of travelers in the Near and Middle East who are interested in antiquities without being already trained archaeologists. Much knowledge is lost because it comes in the way of those who do not know how to profit by it or to record it. 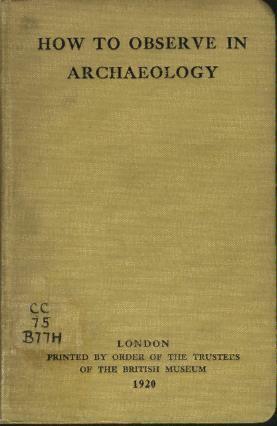 Accordingly, it has been thought that a handbook of elementary information and advice may be found of service by travelers with archaeological tastes; and the Trustees of the British Museum have undertaken the publication of it. Topics: New Approaches About Archaeological Theory; Use of Geophysics on Archaeological Fieldwork; New Applied Techniques - Improving Material Culture and Experimentation; and Sharing Knowledge - Some Proposals Concerning Education. by Frank Stevens - Sampson Low, Marston & Co.
Amongst the many stone circles scattered over Great Britain, Stonehenge is unique, in the fact of having its stones carefully though roughly worked; and also in the introduction of the horseshoe within the circles, in the design of the building.